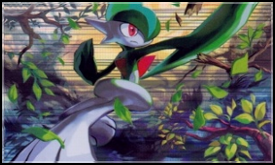 Since I first saw the Ralts that the character Wally gets in the course of Ruby and Sapphire I knew that I wanted this Pokémon in my team, especially after seeing it's evolutions. Because... well... I was always convinced that Gardevoir was meant to be female... and Game Freak just forget to put it as "female only" in the game. "A real male counterpart for Gardevoir would be cool. Maybe with swords and with Fight as dual-type?" Well... Game Freak made a 14-year old boy really happy the day they released Diamond and Pearl. I actually planned to name my Gallade "Creror", since I usually name my Trainer "Alex" or "Axel". After I started to name my Trainer like I named myself in the internet, I was with no name. In reference to the meaning of my internet name, I planned on naming him "Dusk" but that name went to my Gengar later as it was more fitting for him. In the end, I settled with Esper, as Gallade was still Psychic. Physical but Psychic nonetheless. Catched at the 17th March 2011 - Like with my Gengar, just swapped the 3 and 7 in my birthday.